Fairtrade. Organic. Coffee on a mission. Plastic free. Dark - 5. Climate Neutral Company - First Climate Certified. 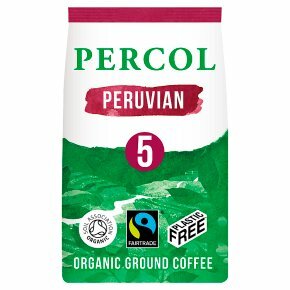 Origin: 100% Peruvian Arabica Roast: Medium / Dark Roast Taste: Pecan and Raisin Grind: Freshly Ground for Cafetière and Filter Coffee This coffee is organic, picked by hand, and freshly roasted in the UK. When you care, you do it properly. Brewing the Perfect Cafetière Coffee 2 tablespoon (15g) per 250ml cup. Add water just off the boil. Stir, then brew for 4 minutes. Plunge, pour and enjoy.